The Vatican has launched an investigation into alleged financial irregularities in the Sistine Chapel Choir. Source: The Tablet. In a brief statement released on Wednesday, the Holy See confirmed that Pope Francis had several months ago authorised an inquiry into “economic-administrative aspects” of the 550-year-old papal choir. La Stampa reported that Vatican magistrates have questioned the Sistine’s administrator, Michelangelo Nardella, who was suspended from his position in July, and more recently the director of the choir, Msgr Massimo Palombella. The investigation is understood to centre around accounting procedures while Italian media are reporting the allegations of money laundering, fraud and embezzlement. Mr Nardella’s suspension came at the same time the choir cancelled its planned month-long tour to the United States in July without issuing an official explanation. Believed to be the world’s oldest choirs, the Coro della Cappella Musicale Pontificia was founded in 1471 but traces its roots to 600 when Pope St Gregory the Great founded the “Schola Cantorum”. 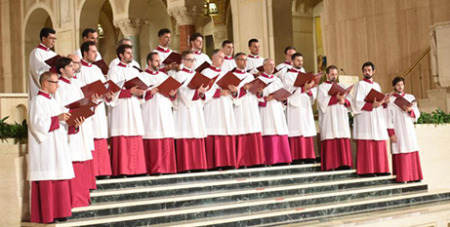 Made up of 20 adult singers and around 30 boy altos and contraltos, the choir sings at papal liturgies, produces CDs and tours across the world. In its statement the Vatican emphasised the investigation was ongoing. Msgr Palombella and Mr Nardella could not be reached for comment.